The high concentration of sugar in the blood damages the nerve cells, particularly those of the peripheral nerves. Besides the glycemic compliance, some nutrients can help preventing or slowing down the neuropathic process. For example, vitamins B1, B6 and B12 contribute to the normal functioning of the nervous system. 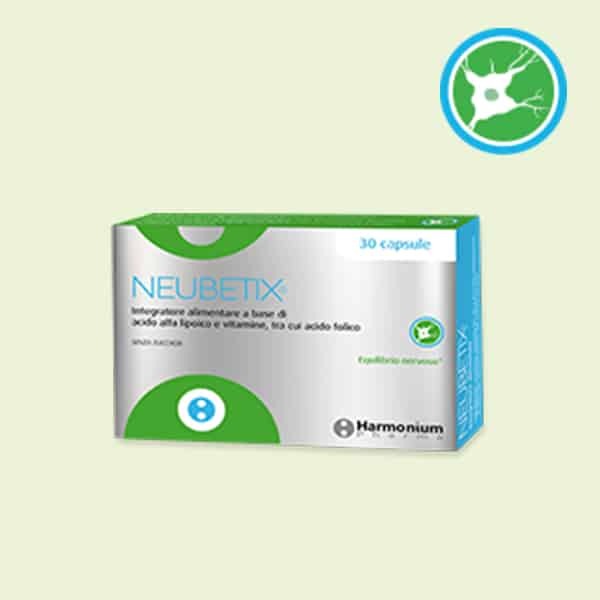 NeuBetix is a food supplement containing alpha-lipoic acid and B vitamins, including folic acid. The synergy between these components act against the oxidation processes in case of the neuropathy, ensuring a smooth functioning of the nervous system. We recommend taking one capsule a day. Diabetic neuropathy. – Charnogursky G1, Lee H2, Lopez N2. Handb Clin Neurol. 2014;120:773-85. Methylcobalamin: a potential vitamin of pain killer. – Zhang M, Han W, Hu S, Xu H. Neural Plast. 2013;2013:424651. Treatment of diabetic mononeuropathy with alfa-lipoic acid – Tankova T, Cherninkova S, Koev D. Int J Clin Pract. 2005 Jun, 59 (6) :645-50. The oral treatment with alpha-lipoic acid improves symptomatic diabetic polyneuropathy: the SYDNEY 2 trial – Ziegler D, Ametov A, Barinov A, Dyck PJ, Gurieva I, Low PA, Munzel U, Yakhno N, Raz I, Novosadova M, Maus J, R. Samigullin Diabetes Care. 2006 Nov, 29 (11) :2365-70. Effect of alpha-lipoic acid on symptoms and skin blood flow in diabetic neuropathy. – Jin HY, Joung SJ, Park JH, Baek HS, Park TS., Diabet Med 2007 Sep, 24 (9) :1034-8. Thioctic for patients with symptomatic diabetic polyneuropathy acid: a critical review – Ziegler D Treat Endocrinol. 2004, 3 (3) :173-89.